Specimens of Printing Types from Stephenson Blake The Caslon Letter Foundry Sheffield (Sheffield, 1953). 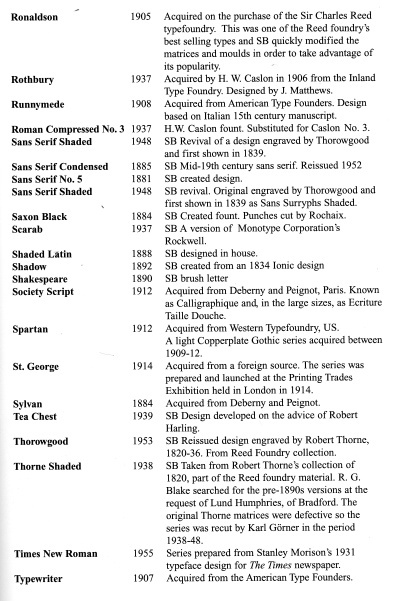 Roy Millingon: Stephenson Blake The Last of the Old English Typefounders (Oak Knoll Press, 2002). Mac McGrew: American Metal Typefaces of the Twentieth Century (2nd rev ed) (Oak Knoll Books, New Castle, Delaware, 1993). 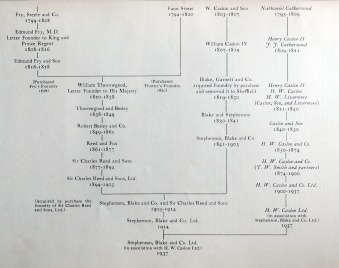 W. Pincus Jaspert, W. Turner Berry, and A.F. Johnson: Encyclopaedia of Type Faces (first paperback edition) (Cassell and Co, 1990). 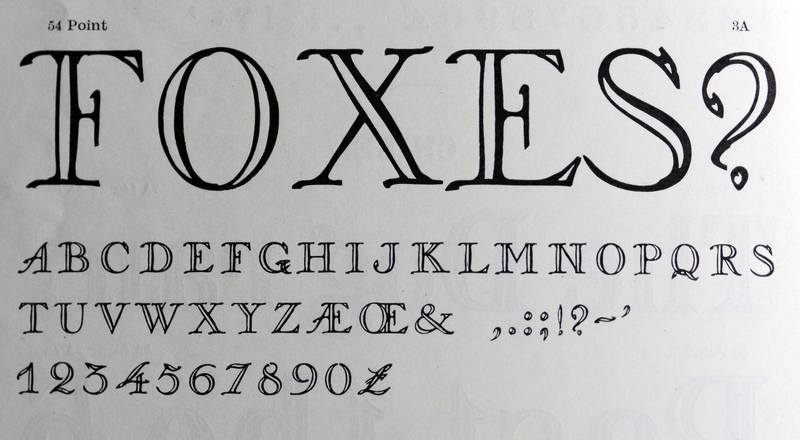 Bologna (1946): this beauty is one of the more famous Stephenson typefaces. 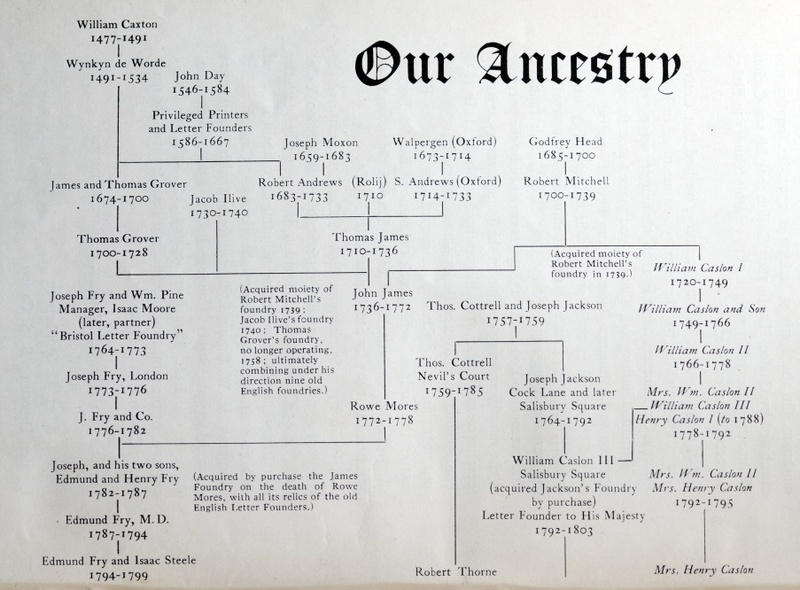 McGrew explains its history, which once again starts in the United States: Humanistic was designed by William Dana Orcutt and privately cast by ATF in 1904 for the University Press, Cambridge, Massachusetts. It is a careful rendering into type of the round humanistic writing of the Renaissance period, based in particular on the 1485 manuscript of Antonio Sinibaldi's Virgil in the Laurentian Library at Florence, Italy. This is considered by some to be hand-lettering in its most beautiful form, and occurred after the development of roman types as we know them. In 1940 this type was adapted to Monotype keyboard composition, under the direction of Orcutt and Sol Hess, the 21-point size being used for a large edition of Science and Health. The Monotype cutting, known as Laurentian closely follows the foundry version, including some but not all of the original alternate characters. A few years later the design was modified by Stephenson Blake in England, and issued as Bologna; this in turn was adapted by ATF as Verona. Millington says that it corresponds to Petrarch at ATF. In any case, the type is based on the 15th century handwriting of Sinibaldi. And here is that 1952 predecessor, Youthline Script. A copperplate script for the banking and insurance industry, it was a Stephenson and Blake original. For a modern digital version, see the beautiful execution by Rebecca Alaccari and Patrick Griffin as Sterling Script (2005, Canada Type). Engravers Shaded. 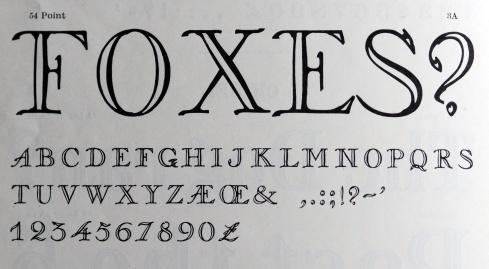 Engravers Roman was purchased from the Inland Type Foundry in 1912. 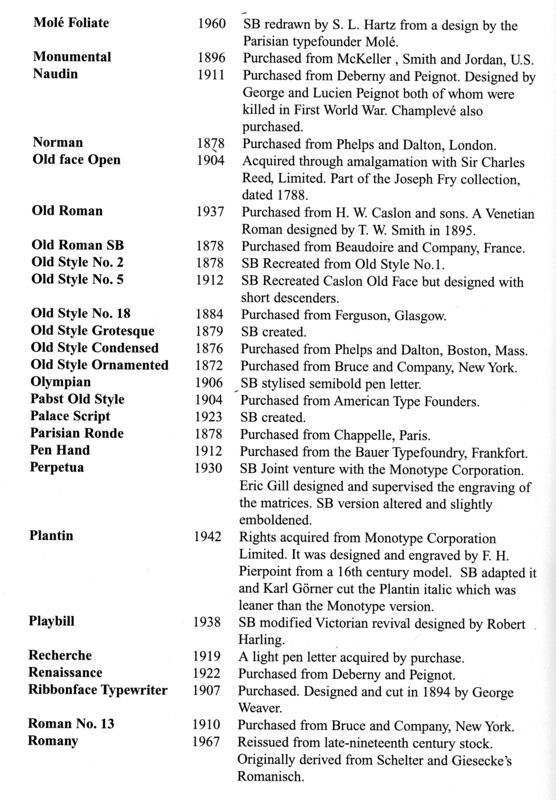 About that original, McGrew writes: Engravers Roman was designed by Robert Wiebking and advertised by BB&S in 1899 as the "latest design"-"the only genuine." Other founders had introduced some similar faces a short time before, all imitating favorite designs of copperplate and steelplate engravers for fine stationery and announcements; Hansen called its version Card Roman. Engravers Roman was shortly supplemented by Engravers Roman Condensed and Engravers Title- the latter was a companion bold face which was displaced by Engravers Bold, designed by Morris Benton for ATF in 1902, and later cast also by BB&S. Western Type Foundry and later BB&S also had Engravers Bold Condensed, and a companion cap-and-lowercase face known as Engravers Litho Bold Condensed, designed by Robert Wiebking in 1914. However, Engravers Litho Bold, designed by Wiebking in 1915 for Western as Rogers Roman, was a substantially different face. Compare Card Mercantile, Bran don, Litho series. ATF issued Engravers Shaded, designed by Morris Benton about 1906, while BB&S had Engravers Roman Shaded, formerly Chester Title, designed by Sidney Gaunt in 1914. Compare Lithograph Shaded. Offset Engravers Roman and Offset Engravers Title were cut in reverse for a process of transferring proofs of type to lithographic stones. 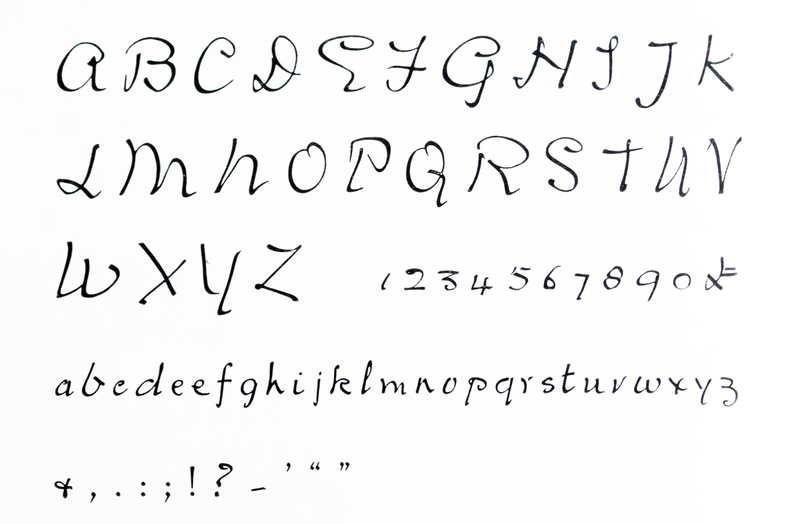 Francesca Ronde is an original script font from 1948, based on the handwriting of Lady Frances Stephenson. Jaspert et al do not like the wild the variation of the inclinations of the letters. 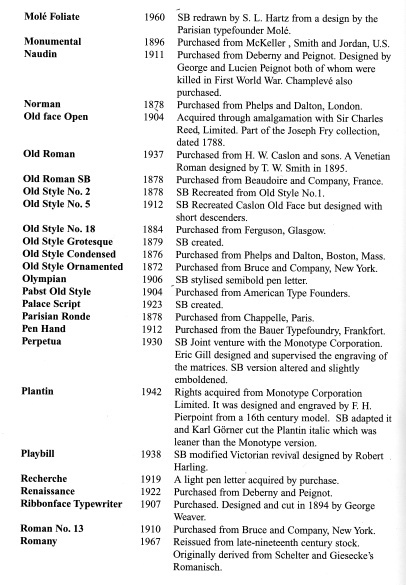 Imperial Script: Cut in 1905 by Karl Gomer, who cut many other faces at Stephenson Blake, such as Chisel (1935, design by Robert Harling), Imperial Script (1905), Long Imperial Script (1906, design by Elisha Pechey), Thorne Shaded (1938) and Plantin (1942, designed and engraved by F. H. Pierpoint from a 16th century model, adapted by Stephenson Blake and cut by Gomer). It is unfortunate that P22 named one of its calligraphic scripts (by Rob Leuschke, 2003) P22 Imperial Script, because it is totally different. 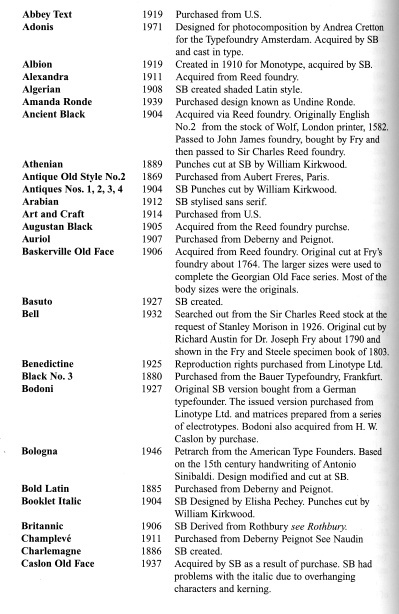 There is nothing British about Le Champlevé: it was purchased by SB in 1911 from Deberny Peignot. It is in fact the Openface style of Tradition, a type designed by Bernard Naudin, whose open capitals are called Naudin Champlevé. Tradition too was bought in 1911 from Deberny Peignot by SB, and called Naudin at SB. A digital version was created by ARTypes / ARS Type, under the name Le Champlevé. Madonna Ronde is the regular version of Madonna, so the discussion above applies. Shown is Mercury Light. Now, Mercury too is a copy. 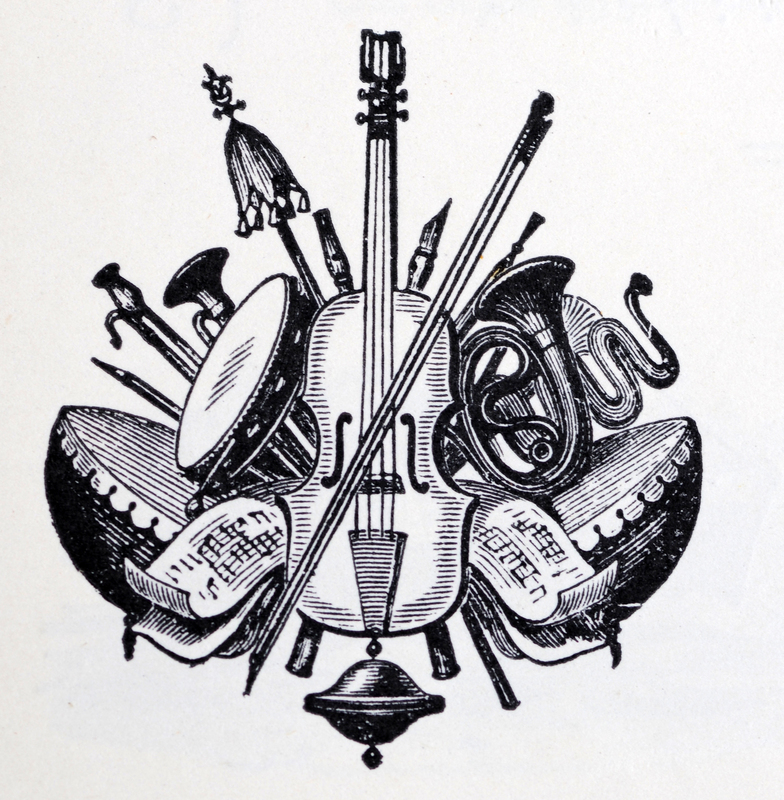 The original was done by Erich Mollowitz in 1936 for Trennert, and was called Forelle or Rhinegold. The is called Old Style Head Piece No 739. Parisian Ronde was purchased in 1878 from Chappelle in Paris according to Millington. 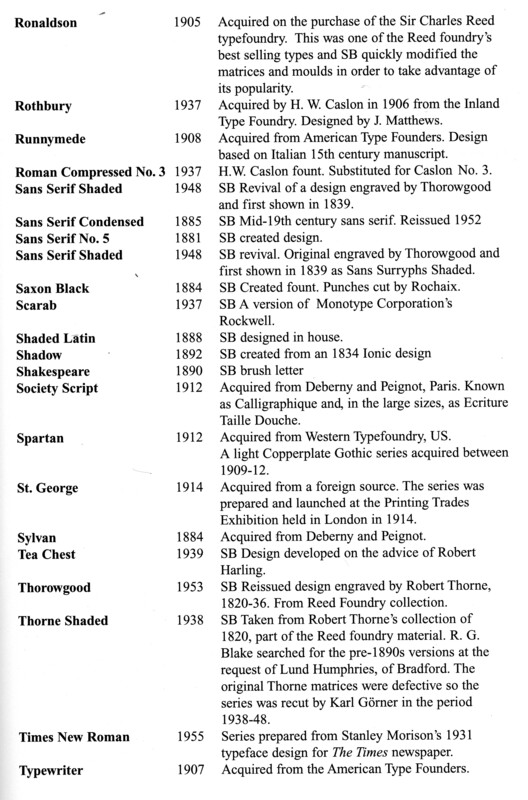 Others say it was bought from Inland in 1905, where it was called French Script, patented there by William Schraubstadter. 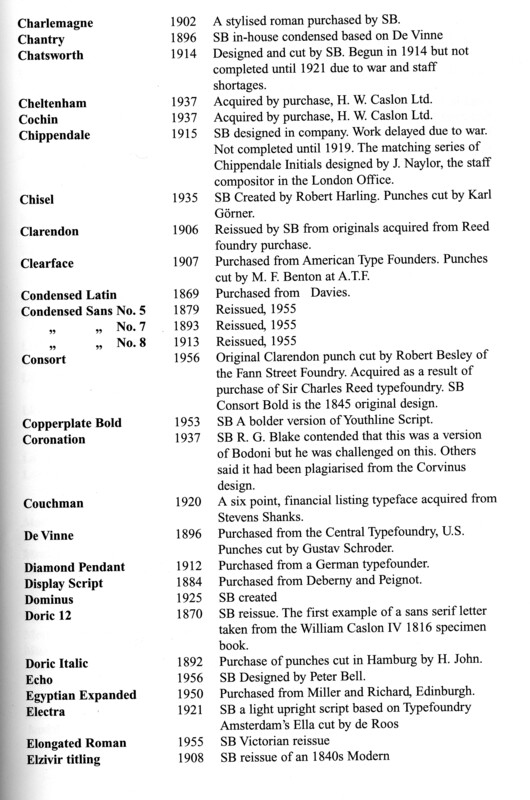 The American Typefounders called it Tiffany Upright and Typo Upright (by Morris Fuller Benton). 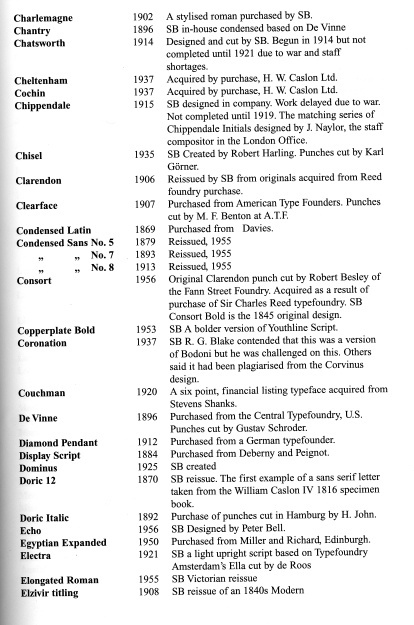 Typo Upright was digitally adopted by many: Linotype (Linoscript), Bitstream, and so forth. 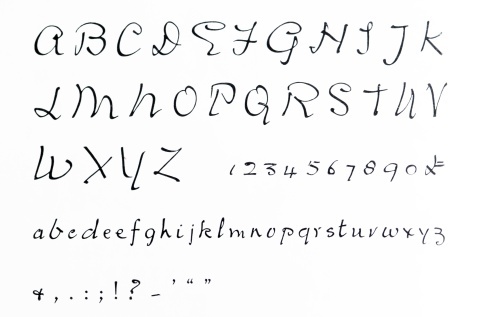 Again, ARS Type has a recent digital version called Parisian ronde. Saxon Black's punches were cut by Rochaix in 1884. 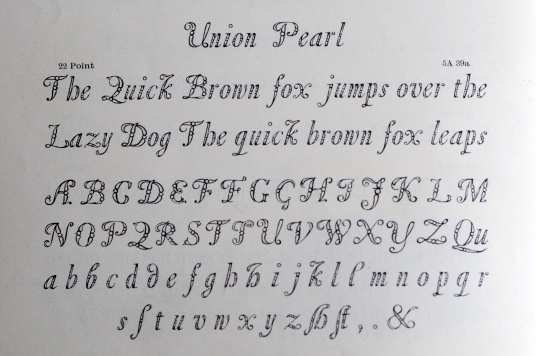 Union Pearl is the first known English decorated letter (ca. 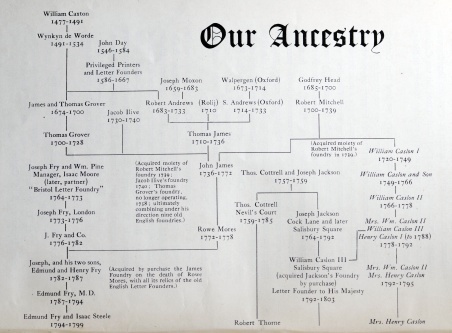 1690), attributed to the London-based foundry of James and Thomas Grover, active in the late 17th century. Via Fry and Fann Street Foundry, it made its way to Stephenson Blake. 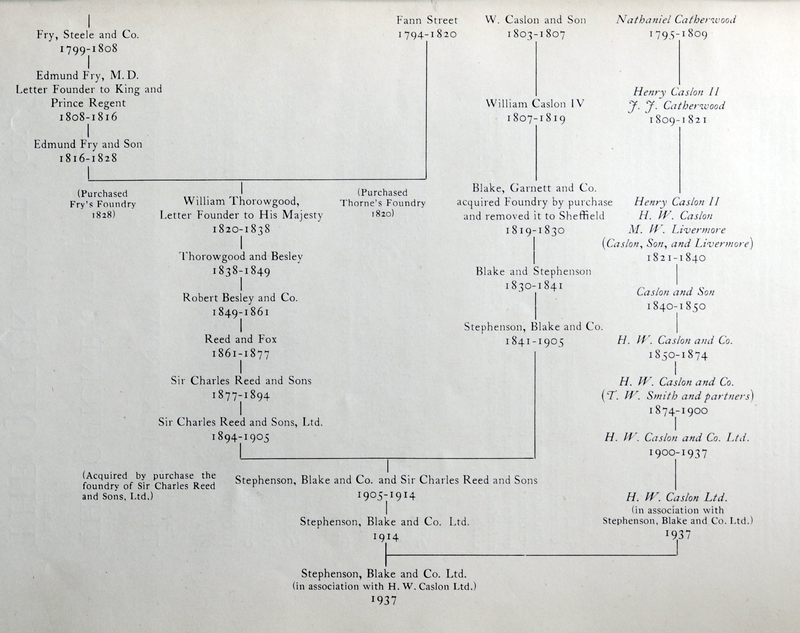 The listing of Stephenson Blake types according to Millington.